The bird collection of The Field Museum houses one of the largest and most comprehensive scientific collections of birds in the world. The collection began as a byproduct of the Field Columbian Exposition in 1893, when Ornithology was one of six scientific departments of the new museum. The first large core collection came with the hiring of C. B. Cory in 1906. The next fifty years were a period of major acquisition of large collections from around the world. In 1920, the collection contained about 50,000 specimens, by 1940 it had grown to 137,000, and in 1960 it held 262,000 specimens. Following accession and cataloging of a major acquisition in 1980, the collection numbered about 310,000 specimens. As a result of a vigorous collecting program, the collections have grown substantially over the past fifteen years. Today there are more than 500,000 specimens in the Bird Division's skin, anatomical, egg, and nest collections. Today, the Division of Birds houses the third largest scientific bird collection in the United States. The main collection contains over 480,000 specimens, including 600 holotypes, 70,000 skeletons, and 7,000 fluid specimens. In addition, the division houses 21,000 egg sets and 200 nests. The scope of the collection is world-wide; all bird families but one are represented, as are 90% of the world's genera and species. Included among its many historically and scientifically valuable individual collections are the H. B. Conover Game Bird Collection, Good's and Van Someren's African collections, C. B. Cory's West Indian collection, the Bishop Collection of North American birds, a large portion of W. Koelz's material from India and the Middle East, and many separate collections from South America, Africa (Hoogstraal from Egypt) and the Philippines (Rabor). As priorities and staffing of educational institutions shift, teaching and research collections can often become orphaned. 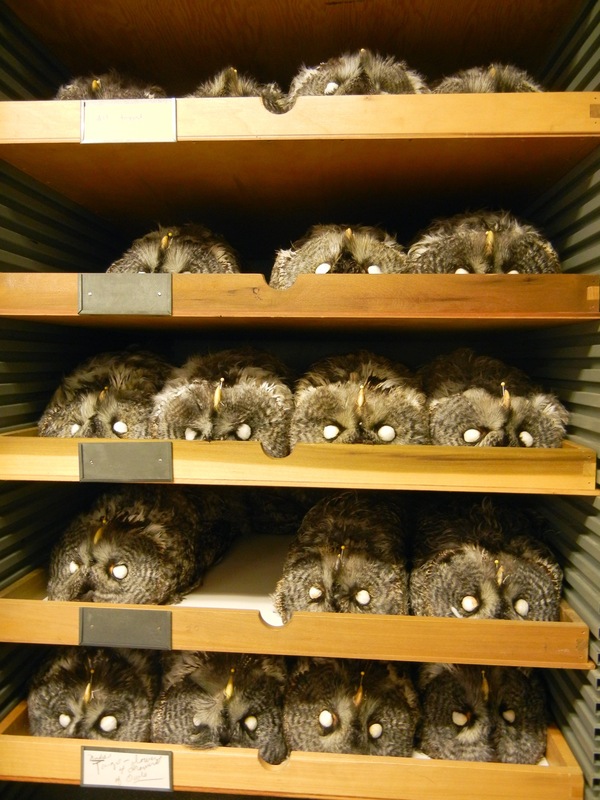 In recent years, the Division of Birds has incorporated several such collections (from Northern Illinois University, Princeton University, University of Miami, and the G. E. Woolfenden Collection). In addition, the Bird Division has acquired the Canada Goose collection of Harold Hanson, formerly housed at the Illinois Natural History Survey. Geographic Strengths- The collection is strongest in North American (including all species and virtually all subspecies), Neotropical and African material (about 95% of species in both areas), the Philippines and India. Over the last fifteen years, Field Museum has developed excellent collection strengths in Madagascar. Significant additional holdings exist from all regions of the world except Micronesia. Even in areas of relative weakness, however, large-scale exchange programs with other museums have resulted in at least synoptic representation. Collections are at the heart of Field Museum. Our collections are worldwide in scope and encompass most of known avian diversity. These collections form the basis for our research programs and have informed current and past generations of scientists, conservation biologists, and policy makers. To learn more about our collections and search our database of specimens, visit our collections pages: Bird Specimen Collection, Bird Egg Collection, Bird Tissue Collection.